Sarah Wright woke up a few times after parties in strange places―but the morgue’s a first. At eighteen, she’s eager for a taste of independence, moving out of state to attend college. A change of scenery is extra-needed due to a bad breakup with her boyfriend, Scott. However, soon after escaping the body cooler, she makes two startling realizations: vampires are real, and she is one. There’s nothing quite like an untimely death to ruin plans. California’s sunny beaches aren’t the best place for vampires to chill, and worse, not only does she wind up stuck in Seattle, she’s still living (figuratively) with her parents. They take the news surprisingly well―after all, it’s better than burying her―even helping move her bedroom to the basement. A disinterested sire, distraught friends, nosy Men in Black, and awestruck younger siblings complicate her adjustment to the new normal of being an immortal still subject to her parents’ rules. Undeath has its perks, but it also brings enemies. Without a copy of ‘Fangs for Dummies,’ Sarah’s left scrambling for answers when one such new enemy attacks her siblings and friends. 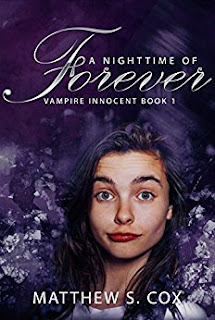 If she can’t figure out how to vampire, her attempt to spare her family the grief of losing her may wind up killing them. This book is not your normal vampire book. Yes there is a good looking vampire but this is a bout a girl who is fumbling her way through life . Sarah is you typical high school senior all she wants to do is get out and head to university, she is your typical teen ager. she fun and well a little naïve some of the time . She is still that way as a vampire also. She is so much fun to read . I loved her . Her family is devoted to her , even though she is dead . Dalton well he is to me not the best vampire , its like he just doesn't really want to be there most of the time . He basically just gives Sarah the basics of what is going on . But he does come through when she needs him . All the characters are well written and complex . They are all sweet and funny .